Sunday, October 5, 2014 The Department of Child & Family Studies continues it's large impact on Florida's growing number of children and adolescents in need of behavioral or developmental support services. In the past few years, several centers housed within CFS have seen increased funding to meet the rising needs in homes, schools and communities. Sunday, September 28, 2014 Funded by the U.S. Department of Education, Office of Special Education Programs, students accepted into the "Project ABA": Preparing Related Services Personnel in Applied Behavior Analysis for Children with Autism program will become school-based behavior analysts working with children with autism. Sunday, September 28, 2014 All ABA faculty members, 5 doctoral students, and 18 master’s students presented. WFLA profiles two CFS programs working together to fast track children on the Autism spectrum into mainstream schools. 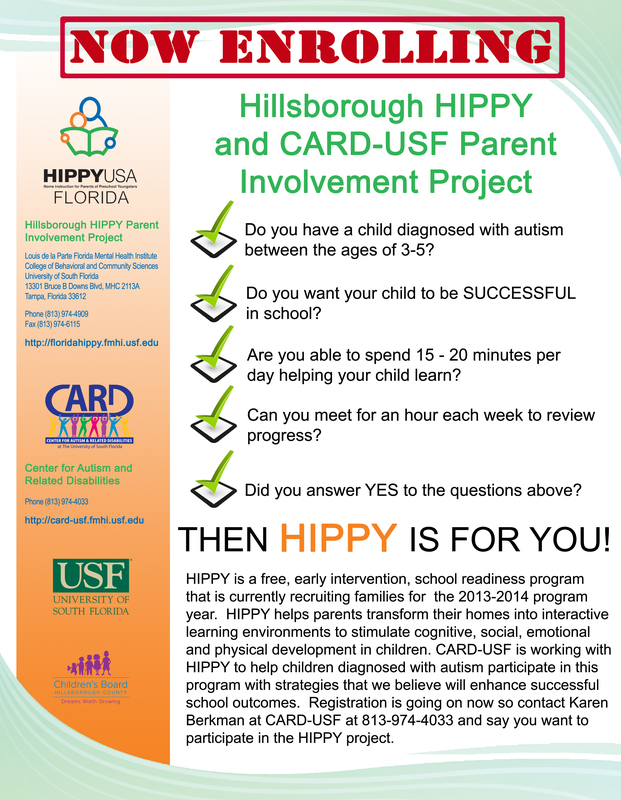 Wednesday, September 24, 2014 The Home Instruction for Parents of Preschool Youngers (HIPPY), and the Center for Autism & Related Disabilities at USF have joined in partnership to offer their evidence based school readiness program to families with 3 and 4 year olds at no cost. View WFLA video. View family recruitment flyer. Monday, September 8, 2014 The University of South Florida now offers a new, comprehensive online Graduate Certificate in Applied Behavior Analysis to prepare professionals to work with individuals with special learning and behavior needs. Applied behavioral analysis (ABA) can help create treatment plans and supportive environments for children and adults living with a disability, mental illness, or behavioral disorders such as autism, ADHD or addiction. Thursday, August 28, 2014 The 28th Annual Research & Policy Conference on Child, Adolescent, and Young Adult Behavioral Health invites proposals for research benefiting children, youth and their families. The deadline for submissions is October 24, 2014. Friday, August 22, 2014 Dr. Hernandez was one of two panelists selected to speak at a Capitol Hill briefing entitled Children’s Mental Health: The Importance of Early Identification and Intervention on Friday, August 15th. Thursday, July 17, 2014 USF's Center for Autism & Related Disabiities and Applied Behavior Analysis Program were among local organizations supported by the event held April 5th. Tuesday, July 15, 2014 She was awarded the National Association for People Supporting Employment First (APSE) Research Award at the national conference held in Long Beach, California in July 2014. Friday, July 11, 2014 The Learning Academy and Employment Services was among only three programs at USF selected by the Division of Vocational Rehabilitation to showcase their work during a visit with Janet LaBreck, Commissioner of the Rehabilitation Services Administration (RSA). Wednesday, July 9, 2014 CFS's Mary Armstrong, PhD and Amy Vargo, MA are among faculty and staff who work on the Agency for Health Care Administration (AHCA) contract. $100 Donation Dream for CARD-USF Quickly Turns to $4,000 Reality! Friday, June 13, 2014 Jared and Kelli set up an 8-hour charity stream for autism awareness through their Twitch online community. Monday, May 26, 2014 Over 200 guests along with Honorary Chair Gayle Guyardo, attended the fundraiser for the USF Center for Autism and Related Disabilities held at the Ybor City Museum Garden on April 25th. Friday, May 9, 2014 Dr. Cohen has spent the last 15 years studying murder-suicides around the world.